Selfless acts of kindness are part of Christmas, with strangers wishing every one holiday cheer in many different forms. The radio and television stations are full of individuals randomly singing Christmas carols to unknown individuals, paying for the person behind you in the drive thru, or even settling a layaway debt for a nameless person. These stories warm the heart and give hope to goodwill in our fellow man. However, majority of these stories are about adults who desire to bestow compassion to a populace in this difficult economic period. Rarely do you hear of a child with a self-sacrificing heart that is considerate and sympathetic for others, the “Littlest Angel” so to speak. Georgianah Barrow is an average seven year old who loves American Girl dolls, ballet and spending time with her friends. She loves to laugh and enjoy life. Yet, Georgianah’s empathy is extraordinary for a young lady of her age, and her actions demonstrate this. From an early age, Georgianah’s parents have always been open to the fact that some children are ill and have to spend time in hospitals. As donors to St. Jude’s Hospital, pictures of children who are enduring unimaginable suffering would be a highlight to young Georgianah. She would tenderly pack the images around, talking about the child as if she knew him/her. Georgianah would ask others to join her to pray for this individual. To date she has given almost 30 inches of hair to Locks of Love and Pantene, and encouraged many of her friends and family to do the same, in order to help provide wigs for patients with cancer. When her younger brother was admitted into the hospital during the early part of the summer of 2012, Georgianah was fascinated and intrigued that he was given a “Linus Blanket.” The onslaught of questions began about children in the hospital at various times during the year. Her final query was, “What happens to kids in the hospital during Christmas?” To this her mother had no response, as she herself was unsure. So a family research project ensued. After determining that many hospitals that specialize in pediatric care rely on the donations of people and business to aid in providing Christmas presents to the patients within its halls, Georgianah requested to contribute to a pediatric facility. The family consented and gave for the first time to Children’s Hospital of the King’s Daughters in Portsmouth, VA in 2012. That began the legacy of this littlest angel. For Georgianah’s birthday party in November of this year she requested that all attendees bring an art supply that would be donated to provide materials to cancer patients who enjoyed art during their long days of chemo or radiation. She made and sold loom bracelets, and saved every dime she could earn to help purchase gifts for her chosen pediatric hospital. By the end of the day, Georgianah had raised, with the help of her little brother William, $250 that she used to purchase socks, slippers and gloves for patients. Once she delivered the articles, she had collected/ bought nearly 400 items that valued practically $1,500. 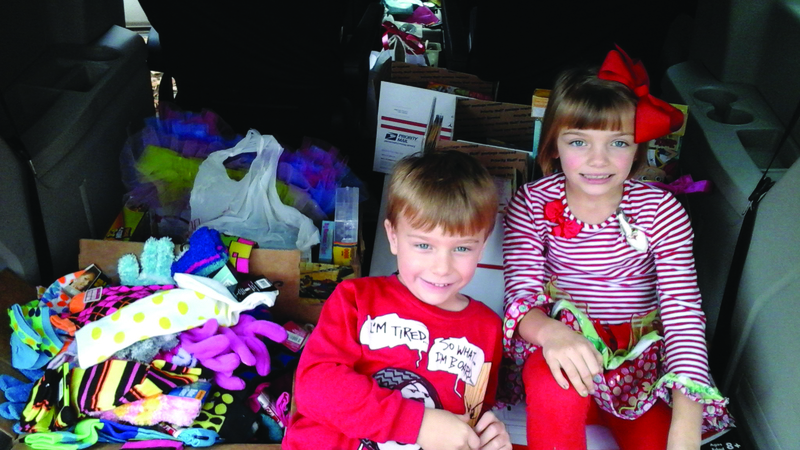 Early in December, Georgianah, William and her mother transported everything to Children’s Healthcare of Atlanta Scottish Rite. This modest donation will be distributed to children who have to experience being in the hospital during Christmas tide. However, it is the heart of a child that dedicated and persevered, convincing adults to join her in this worthy cause. The littlest angel of Griffin, Georgia comes in the form of a regular seven year old girl who has a heart that is colossal. This story is meant to inspire those whose hearts have grown cynical or hardened by the world. The testimony of this young lady shows that even the youngest person can have an impact on his/ her community. What have you done this Christmas, or any time during this year, to leave your impression on those around you? For additional information, contact Cassie Barrow at littlelady1861@inbox.com or 770.468.4313.